During the last weeks of my stay in Glasgow, my friend, Mr. J.L. Byrom, J.P., brother of Mr. B.F. Byrom, suggested that I should take a tour round the world, spending most of the time in Australia, and coming back by way of America. He most generously bought my ticket for the whole journey, a valuable gift. Accordingly I set sail from Tilbury Docks on board the P. and O. liner, Rome, in April, 1894. We sailed via the Suez Canal, and landed at Adelaide on May 22nd. We were five weeks on the sea, and a more dreary, profitless five weeks I do not think I have ever spent in my life. I was heartily glad to get on shore again. I am a bad sailor, and. I was infinitely tired of the sea. Besides, the people on board were the most godless set of beings that I had ever mingled with. They spent most of their time in drinking and gambling, and all the forms of worldliness that they could devise. I have seen them make a pool on Sunday morning on the running of the ship, and then go in to prayers. The voyage was marked by two incidents which still remain in my memory. Some of us went ashore at Port Said. This town is the most desperately wicked place on earth, and we were warned by the captain that we must go about in groups. It was not safe for any one of us to go alone. The place is simply infested with pestering vendors of all sorts of trifles. They knew the names of a few eminent English people, and we were addressed as Mr. Gladstone or Lord Salisbury, or Lord Rosebery, or by the name of some other English notable. The vendor who pursued me called me Mr. Gladstone. His attentions were unlimited. He followed me up and down I do not know how many streets, pressing me to buy some cigarette holders. I told him that I did not smoke, but that had no effect on him, because he did not seem to understand me. Then I acted out my dislike of smoking. I feigned to be putting a cigarette in my mouth, and then taking it out and throwing it away with an expression of disgust. At last it dawned upon the Arab what I had been trying to say, "Ah, oh, eh, umph! You a tottle-ottler! I spend all my speak on you for nothing!" He walked away, looking at me with infinite scorn, but I felt much relieved. We were diverted at Aden by the feats of the small diving boys. The passengers amused themselves by throwing pieces of money into the water, and seeing the boys dive for them. A coin does not take a straight course to the bottom. Its pathway is rather a wriggling one, and the art of the boys is to get hold of the money while it is still on its course to the bed of the ocean. They are exceedingly smart little fellows. One of them clambered up the side of the ship like a monkey, and taking ten threepenny pieces out of the right side of his mouth, held them up, saying, "Big money for that, please!" He meant: "Give me half a crown for it." When he was given his half-crown he took ten more threepenny pieces from the left side of his mouth and asked for another half-crown. The person who had obliged him before could not do so again, and so I, who was standing by, was asked to accommodate him. I took six half-crowns out of my right pocket, and before I had brought my left hand to the right, he had whisked off four of them, and dived again into the sea. His smartness was much admired, and I was greatly chaffed at being so cleverly done. "You are a fine gipsy, you are" said the people. The Sunday before we landed, while I was dressing for dinner in my state room, there was a knock at my door. A deputation of ladies came to request me to give a little lecture to the passengers that evening. I knew they did not desire to hear the Gospel. I knew they had been rude to the good old Bishop on board the ship, who had lovingly and tenderly remonstrated with them on their gambling. "It does grieve me," he said, "to see gentle girls gambling like old men." They had actually that morning raffled tickets by auction round the old Bishop's chair. The fact is that they were somewhat tickled at having a gipsy travelling with them, first class. They were curious to know all about me, and I had taken care not to satisfy their inquisitiveness. Questions were often put to me with the intention of drawing me on. But a gipsy is usually a shrewd fellow, and I was not to be caught. This had annoyed them, and suggested to them the device of getting me to deliver a lecture to them. Accordingly I graciously declined the invitation, declaring "Most of you are going to Adelaide, Sydney, Melbourne, or other of the large towns of Australia. Now I shall be preaching in these towns, and my meetings will be advertised. If you will come and hear me I shall be very pleased." They went away feeling sore and balked. But the incident greatly raised my reputation, even among those who had been maliciously trying to draw me. My fellow-passengers were mostly rich people, but some of them were neither courteous nor kind. I was amused one day by the remark of an insolent young fellow. "I suppose, Mr. Smith," he said, "the society on board is very different from what you are accustomed to?" I answered," If you mean that it is inferior, it is different." The supercilious youth said no more to me. On another occasion, when we were having some little innocent sports on deck, a general and myself were elected as judges. Two young men, who were competing in an obstacle race, were disqualified before they started - which meant that the race must be re-run. I told them they had disqualified themselves, but they persisted in running. When the contest was over I declared it was no race. A captain in the army, who consisted mostly of legs, and who was a friend of one of the competitors, said, "Who are you, you little under-sized piece of humanity?" "Captain," I said, "my brains are not in my legs." From that moment the gallant captain treated me with the utmost respect. My arrival in Adelaide was quite unheralded. My coming had not been trumpeted abroad, and my sole human equipment consisted of my letters of introduction from Dr. McLaren, of Manchester, and other Free Church leaders. Dr. McLaren had been particularly kind to me in connection with this visit. He called me to his house before I left, and spoke to me about the various places I should visit. When I arrived in Adelaide the Methodist General Conference was in session, and I at once placed my letters of introduction before the secretary. He received me rather coldly, and indeed my reception by the Assembly was anything but hearty and encouraging. Thomas Cook, the well-known Wesleyan evangelist, after conducting a month's mission at Pirie Street Church, Adelaide, had left for the interior of the colony. I had made up my mind to preach in Adelaide, the first city of Australia I touched, and I naturally wanted a mission in a Methodist Church. The Methodist ministers were not at all anxious to have me. "Why did you not tell us you were coming?" "Why did not your pastor write to inform us of your visit to the colonies?" I told them that personally I disliked long preliminary booming, that I desired to begin quietly, to stand on my own merits, and that, besides, my trip to the colony was as much for rest and education as for work. I first approached the superintendent minister of Pirie Street Church, and suggested that I should hold a mission there. My idea was that that would help those who had declared for Christ during the mission that Mr. Cook had just conducted. No, they would not have that at all. Then Mr. Cook had planned to take a mission in Archer Street Church, and had not been able to fulfil his engagement. I saw Mr. Lloyd, the minister, and Mr. Drew, a leading layman, and I suggested that I should hold a mission there. They both said that it would never do. The disappointment that the people had suffered when Mr. Cook failed them would make it useless for me to try to take his place. I said, "If I am not afraid to face this disappointment, I think you ought to give me a chance." I suggested that they should telegraph to Mr. Cook and see what he said. "Mind you, I am no fraud, no adventurer. I shall abide by Mr. Cook's answer." But they were not willing to do this. It was suggested that I should go on to Melbourne to the Forward Movement and conduct a mission there. My Adelaide friends were good enough to say that if that mission was successful they would invite me to their town. I said, "No, I am going to preach in Adelaide if I preach in the street. If my own Methodist Church won't take me in, there are other Churches that will." When I said this I was not speaking without my book, because I knew that Franklin Street Bible Christian Church, of which Chief Justice Way was a member, was open to me. I had met Chief Justice Way in America. He knew me and my work. When I told my Wesleyan Methodist friends that this Church was open to me they said, "Well, suppose you go there for a mission, and if we want you afterwards, will you come to us?" "Yes," I said, "I will." I was somewhat discouraged by this rather freezing reception, but I did not get angry. I felt confident that God had sent me to Australia, and that presently all would be well. I called on the minister of Franklin Street Bible Christian Church, and told him that I knew Gipsy Smith was in the colony, that he was willing to conduct a ten days' mission for the Bible Christians, and that he was prepared to start work on Sunday. It was now Thursday. 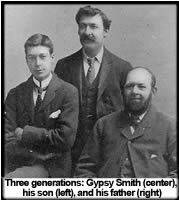 The minister asked me what authority I had to speak for Gipsy Smith, and I replied by saying, "Look into my face and see if you can discover any sign of dishonesty." And he took my word for it, and without any evidence produced, he accepted my statements. We went off together to see the editors of the two newspapers in the city to arrange for notices of the mission. When we were discussing this matter I took my letters of introduction from my pocket, and, handing them to the editor, said, "Perhaps these may be of some use to you." The minister looked at me gaspingly, and said, "Are you Gipsy Smith?" I confessed that I was, whereupon the old man embraced me tenderly. Franklin Street Church was seated for about 700 or 800 people, and it was crowded every night during the ten days of the mission. Sixty or seventy boys from the Way College, who all attend the church, passed through the inquiry-rooms. The great things that were being done in Franklin Street were soon known all over the city, and when the ten days were up Archer Street Church, the congregation that Mr. Cook had disappointed, was ready for me. My feet had been established on a rock in Adelaide. I preached for six weeks in the city to ever-increasing congregations. If my Wesleyan Methodist brethren had received me with warmth and cordiality, I should perhaps have stayed only a fortnight in the town, but I stayed six weeks, because I was determined before I left to make myself thoroughly felt. To our Father's house above. There's a hand held out to me." Some of the poor fellows wept bitterly. I always feel very tenderly towards convicts. When I look at one, I say to myself, like the old Puritan, "There am I, but for the grace of God." Besides, I always reflect that there are a great many persons outside prisons who are worse than those inside. "MY DEAR MR. GIPSY SMITH, - Thanks for the likeness. It is excellent. I was sorry you could not come to breakfast, but I know how busy you must be preparing for your departure. "Pray accept the enclosures - with my kind regards and best wishes for your happiness and usefulness. When the Chief Justice came to England in the Diamond Jubilee year I had some further communication with him. He told me that my work in Australia was not, and never would be, forgotten. The last meeting I attended in Adelaide was the service which Mr. Cook returned to hold as his farewell to the colony. Pirie Street Church was packed to the doors, and a more enthusiastic service could hardly be conceived. Many letters and telegrams were sent from places where Mr. Cook had held missions. Next morning, Mr. Cook and I left Adelaide by the same train, he for Melbourne and I for Ballarat. The railway station was crowded with people who had come to say good-bye to us. "Gipsy Smith took the morning service to relieve Mr. Cook. The building was quite full, an event which has not happened for many a long year at a morning service. The whole sermon bristled with tersely-put truth, straight home -thrusts and earnest appeals, varied in a most natural and easy manner by irresistible flashes of humour and the tenderest pathos. The description of the punishment of his two boys for playing truant, the callousness of the elder, and the contrition, repentance, and forgiveness of the younger, how he reassured himself again and again of the fact of his forgiveness, and then abandoned himself to the enjoyment- of the restored favour of his father, brought tears to almost every listener. After the sermon, Mr. Smith sang 'Throw out the life-line.' He has a beautiful voice, which, moderated and controlled by the heart-feeling behind it, finds a response in the hearts of those who listen which words would fail to elicit. About two hundred stood for consecration at the close of this service. The afternoon meeting was for men only; and a magnificent sight it was, towards three o'clock, to see the great building packed more than full with men, many standing for want of a possible chance to sit down. Gipsy Smith sang, 'The Saviour is my All in All;' and then 'Onward, Christian soldiers,' from that audience, was something to remember. The Rev. Thomas Cook gave the address, a straight-out piece of personal dealing from end to end. At the conclusion, Mr. Smith sang, 'Can a boy forget his mother's prayers?' and eighteen sought and found the Saviour. At the evening service the church was filled to overflowing in every available spot long before the time of the meeting; so the Conference Hall was again opened, and soon also crowded out; no more could be packed in either. Rev. J.W. Tuckfield opened the Conference Hall meeting, while Gipsy Smith sang in the church. As soon as this was over he took charge of the meeting in the Hall, and sang the same piece again: 'Come, the dear Master is calling.' 'God has given every one of you,' he said, 'a square chance for heaven. He has called you by a thousand loving entreaties, by bereavement, by special invitations, such as these meetings, and now He calls you by the lips of a poor gipsy boy, who, although he never went to school, has crossed the Jordan and given himself to Christ.' At the close of this service, sixteen found the Saviour." So great was the impression made upon the people by these services that they besought me to conduct more services for them. I told them that I was in Mr. Cook's hands. It was his mission. He must direct. I would only do just what he wished. The outcome of my friends' importunity was an arrangement that I should conduct noonday services on Monday, Tuesday, and Wednesday. On each of these three days I had a congregation of over 2,000 people, a large majority of whom were men - lawyers, merchants, and workmen. The crowning gathering was on the Thursday night, when I told the people the story of my life. The meeting was announced to commence at 7.30, but by four o'clock the place was crowded, and there were two or three times as many people outside. Wherever a window could be reached from the ground that window was broken, and whatever could be found to stand upon was seized and utilised. Thirty fainting people were carried into the Manse, next door to the church. Mr. Edgar, the minister, told me, when on a visit to Manchester, that he had paid over £7 for broken glass! Had I been on the spot I should have begun my lecture as soon as the place was full, but not anticipating this extraordinary enthusiasm, I had gone into the country to spend the day with some friends, arranging to return in time for my lecture. The crowd bore the long wait of three-and-a-half hours with great patience and good-humour, but it was deemed advisable to put up speaker after speaker to give addresses in order that the audience might be kept Orderly and interested. I spent the last week in Australia at Sydney, in the Centenary Hall, the headquarters of the Forward Movement. The Hall seated 2,500 people, and was the largest building I preached in in the colony but it was far too small for the crowds who came to the services. A great burden of sadness was bearing me down, but God was my strength and my salvation, and I preached the Gospel as well and as faithfully as I could. Another cablegram reached me at Sydney: "Wife very seriously ill. Come home at once." I sailed on the 20th of June. Two thousand people came down to the boat to see me off, and sang, "God be with you till we meet again." I had been barely three months in Australia. My impression of Australia was that there were untold possibilities for Christian work in the country. Many of the people are from England - from home, as they say - and the moment you begin to talk to them about the old country they are home-sick. Their hearts become tender and receptive. There are not a few people in Australia who have been shipped there by their friends in England, so that they may redeem their careers and stand erect on their feet again. Such people gain from their new life not only new opportunities, but fresh susceptibility to moral and religious influences. They make the material among which good evangelistic work can be done. They come to your meetings, and because you are from home, you make a particular appeal to them. You are a link between them and the people they have left behind, and they think you are speaking to them in the name of their friends in the old country. It seemed to me easy to get the Australians to attend evangelistic services. It fell that my visit immediately followed their great financial collapse, and it may be that their distress and difficulties made their hearts more hungry for the Gospel. It came to my knowledge later that three days after I left Sydney it was announced in a Ballarat paper that my wife was dead. Archer Street Church, Adelaide, in which I had conducted a mission, held - a memorial service for her. The Methodist papers in Australia copied the paragraph from the Ballarat paper, and in due course it found its way into the Methodist Recorder. Rev. S.F. Collier at once wrote to the editor contradicting the statement. By this time my wife was much better, but a lie once set travelling is very difficult to overtake. The news of my wife's death spread so wide and so fast, that I have in my home at Manchester a whole drawer-full of letters of sympathy and condolence. I never read them, but Mrs. Smith did and replied to them all. There are people to this day who think I am a widower. Not so long ago I conducted a mission at Chatham where, as my readers will remember, I laboured in the early days of the Christian Mission. I called at the house of a lady who had been very friendly with my wife and myself in those far-off clays, and I told her that I was just going to the station to meet my wife, who was coming from Manchester, and that I should bring her to tea. "All right," said the lady, in cold, indifferent tones, "do as you like." I could not make it out. I wondered whether an estrangement had arisen between my wife and her Chatham friend. Later in the day I again called at this house, making the same statement. "Very well. Do as you like. I do not care." I went to the station and brought my wife to this house. When the two met, the Chatham lady lifted her hands in amazement and exclaimed, "Good heavens I thought you were dead!" Of course, I knew nothing of the rumour concerning my wife's death. Travelling via the Fiji Islands I reached British Columbia, and thence proceeded by way of Montreal to New York. A cable from home was awaiting me, saying that my wife was better, and that there was no need to hurry to England if work demanded my stay in America. Accordingly I paid a short visit to Ocean Grove, and conducted a month's mission in Indianapolis. A local paper said: "No adequate idea of the sermons of Mr. Smith can be conveyed by literal reports of his words, which are apt in forcefulness, illustration, and analogy, for he preaches with greater force and effectiveness by gesture, manners and intonation of voice." Here I met ex-President Harrison in his own home. I found him a courteous, high-toned Christian gentleman, deeply interested in all work for the salvation of men and of the nation. On returning to the vestry at the close of one of the services, there was an old retired minister, with white, flowing locks and a grave, dignified appearance, waiting for me. As I sat down in the chair, he put his hands on my head. I thought he was going to give me a father's blessing. But to my surprise he began to run his fingers through my thick hair and to feel about for bumps. "Are you a phrenologist?" I said. "No, not quite, but I am trying to discover the secret of your success." "Well, sir, you are feeling too high. You must come down here," placing my hand upon my heart. At the Sunday morning service, immediately in front of me sat Dr. Clyne, a throat specialist, who was related by marriage to the pastor of the Church. The doctor could see that I was having trouble with my throat, and he sent a message to me through the pastor saying that he wanted to see me at his office next morning. The doctor in fifteen minutes gave me an amazing amount of information about my throat. He told me that I had pockets in the tonsils, which were in a chronic state of inflammation, and that these pockets needed to be drained out. I was to come to him when the mission was over, and he would set the matter right. In the mean-time he attended almost every service of the mission. On the morning after the mission ended he performed an operation on the tonsils by means of an electric battery, deadening the pain with cocaine. The only unpleasant sensation was the smell of the singeing produced by the electricity. I asked him for his bill, for I would gladly have paid whatever he had asked, provided, of course, it had been within my means. He was a great surgeon, and his fees were heavy. In reply to my question he looked at me quietly for a moment, and said in deeply moved tones: "Sir, two of my boys have been converted during your mission. Will you give me your bill for that? Can I ever pay you for bringing those boys to Christ? How much is that going to be worth to me? I cannot preach, but if I can help you to preach with ease and comfort to yourself, I have a share in your business." Presently the boys came in. The father had given each of them a new Bible, and the lads asked me if I would inscribe their names in them. I reached home on November 23rd. My tour round the globe had occupied eight months.